We are constantly working to develop new business to support the growth and sustainability of Laila’s Fine Foods. 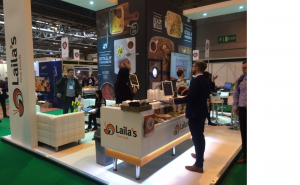 Back in April this year we exhibited at the National Food Exhibition at Birmingham’s NEC. This is the biggest show of the year for our industry and provides the number one route to the UK food and drink market, helping hundreds of companies showcase their products. Buyers and decision makers across the whole industry, from grocery, wholesale and specialty retail to foodservice and manufacturing, attended the event and it gave us a valuable insight to the hottest trends, latest product launches and the industry’s vision for the future. We had many visitors to the stand and the sales team have numerous leads to follow up. As you know, we also strive to ensure the quality of our products is maintained and have in place a series of checks and procedures. Your hard work has paid off as we gained a Grade A in a recent unannounced BRC audit. This is down in no small part to the role of the Technical team and everyone involved in the production process so please keep up the good work and point out any areas of concern to your line manager. In May Nazir, Zera and Jak attended the Grocer Food & Drink Own Label Awards at the Park Lane Hilton, London. These Awards recognize the best in supermarket own label products and we are delighted to say that Laila’s were presented with a Gold for our Extra Special Indian Feast and a Silver Award for our Asda Sweet Chicken Curry. In June we were also awarded with two Silver Awards by the British Frozen Food Association for our Multi-portion Fish Pie and Iceland Chicken & Mushroom Risotto so we would like to say thank you & keep up the Good Work!